Back in May of 2014 I was a Kickstarter supporter of the Makesmith CNC, which was an attempt to build an extremely inexpensive CNC router. The project was 822% funded, and they shipped all the kits in November, almost on time. Yay! I began to put mine together right away. They had pretty good video tutorials on how to do it, but not much in the way of written documentation, and there were some holes in the tutorials. I made a post or two on their forum about my experiences. There were a few minor updates to the videos, made as overlaid titles, but nothing very substantial. I set the project aside to wait for the rest of the community to catch up and participate in improving the design. Over a year later, in December 2015, I picked it up again. I found no improved documentation and relatively little more in the forums, so I just completed the assembly of the mill using my own best guesses. After jumping through some hoops to get their Macintosh software running, I was able to run some initial tests. I wasn’t impressed. As expected, it was really slow, but it’s hard to appreciate how slow without seeing it in person. Also as expected, its axes were pretty wimpy, barely powerful enough to overcome their own friction. One of the cost saving measures that makes the design feasible is that they don’t really try to prevent lost motion, they just measure it with a closed-loop feedback system and try to compensate. All this is more or less as advertised. My particular mill had worse problems. It had a tendency to get stuck in the X and Z axes. This is undoubtedly due to alignment problems with the rails, which arise from some combination of the low-budget design and the assembly procedures I used. Because of the low-budget construction, though, there is no easy way to adjust the alignment after assembly and gluing. I’m sure there’s some way to make the mill work to expectations, but at this point it became clear to me that this mill was going to be frustrating to use. It was just too compromised to reduce cost. By that time it was clear that Makesmith was never going into production with these machines, either. They filled the Kickstarter orders, and stopped. The software hasn’t been updated, and the user forum looks abandoned (overrun by forum spam). Maybe Makesmith reached the same conclusion: that the Makesmith CNC just wasn’t viable. They ran a new Kickstarter project in November 2016 to make a much larger CNC router at a very low cost point. I hope they and their Kickstarter backers have better luck this time. Anyhow, I decided to give up on using the Makesmith CNC. It was fun to build and educational, so I got my money’s worth (more or less), even though I never even mounted a spindle (i.e., a Dremel tool) on the mill. I began researching commercially available mills and a few months later ended up buying the Tormach PCNC 440 with all the goodies for about 55 times the cost of the Kickstarter Makesmith CNC. Needless to say, it’s in a whole different class. All of which is just a long explanation for why I have the carcass of a Makesmith CNC sitting around, capable (barely) of X-Y-Z positioning, but without a purpose. I also had a cheap USB microscope, which was adequately functional but which came with a nearly useless articulated-arm stand. Recently it occurred to me that the Makesmith would work as a positioner for the microscope. With a solid stand and relatively precise orthogonal positioning axes, the microscope would be transformed from a toy into a tool. 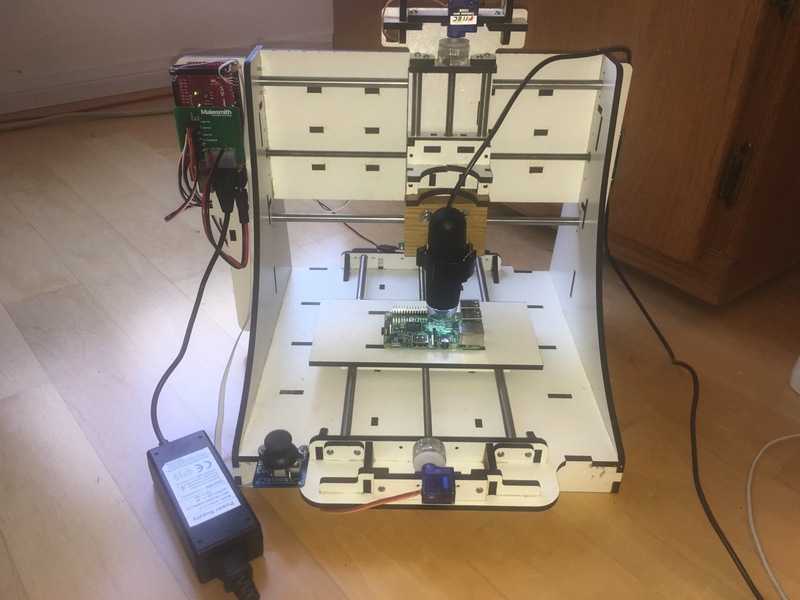 Holding a lightweight plastic microscope and positioning it interactively under manual control is far less demanding for the Makesmith chassis than working as a milling machine. 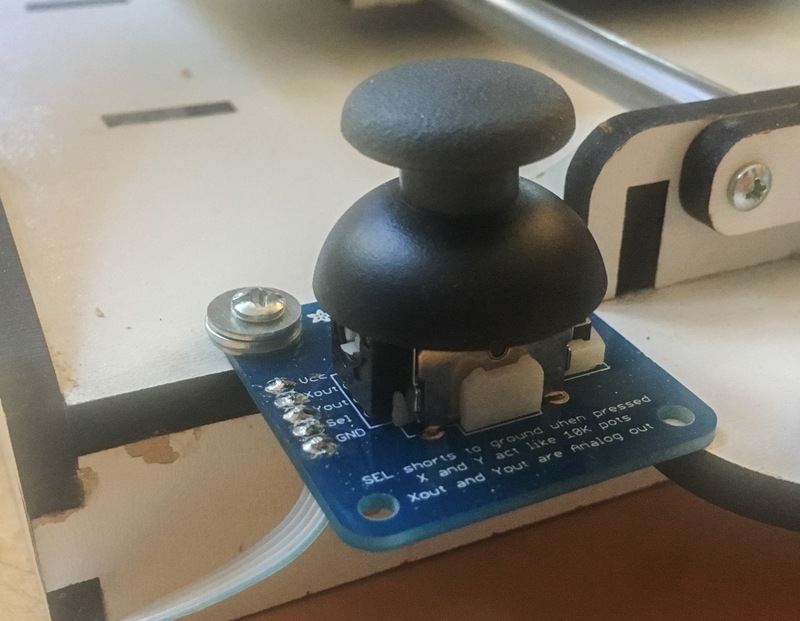 I wanted interactive control of the positioner, independent of any computer software, so I bought a joystick on a breakout board and wired it up to spare I/O pins on the Arduino Mega 2560 that serves as the brains for the Makesmith CNC. We see just a few of the pins on one side of the same chip. 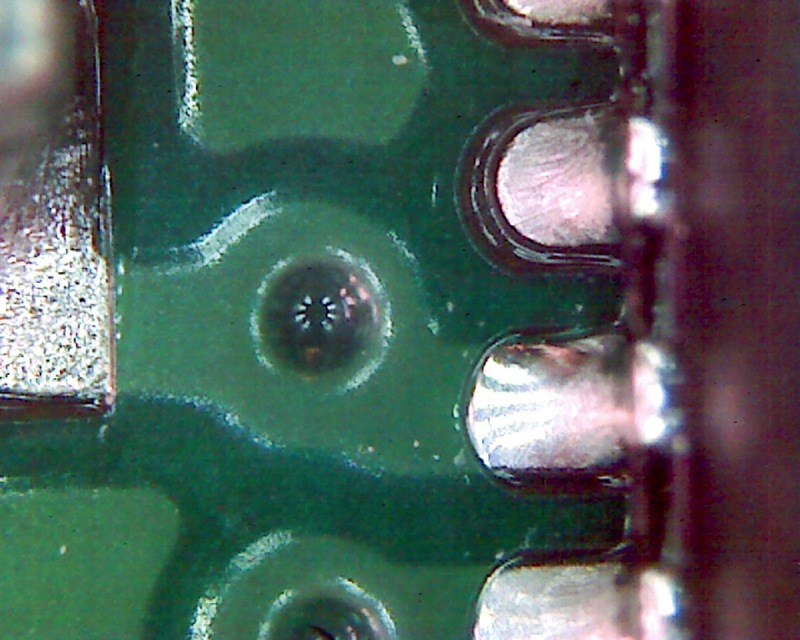 Near the middle of the image is a via, a tiny hole that routes the circuit to the other side of the board. Those little white specks inside the via are formed by a silk screened annotation on the back side that happens to overlap with the hole. 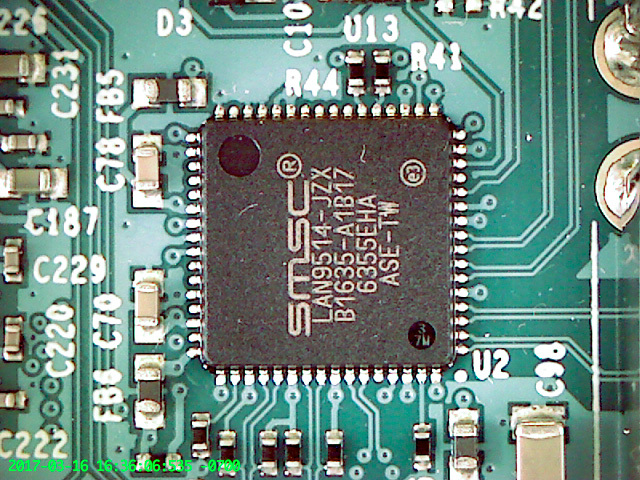 At this magnification, the depth of field is pretty shallow, so the top of the chip and of C78 are quite out of focus. The motion of the Z axis is quite sufficient for focusing the microscope, even at maximum magnification. It could use more vertical travel for working on larger subjects, but that’s true of every positioner in the world. The X and Y axes are still slow, but even at minimum magnification they move the image about as fast as you’d want them to. The speed only becomes an issue when you need to move the microscope to a whole different area. Often it’s easier to just move the subject around on the platform. The microscope can capture video, too, but the motion isn’t really smooth enough for that to be impressive. I’m using miXscope software to control the microscope from a MacBook Air. That software has a number of useful features for technical microscopy, but it’s a bit long in the tooth and a bit crashy on current versions of macOS. The next obvious application for a microscope with a positioner is to automatically photograph a grid of overlapping images at different X-Y offsets, which can then be stitched together to create a larger high-resolution image. To do this I’d need to add back some of the complexity of the control firmware, so it’s on the back burner for now. Another variant would be to take multiple exposures at different Z offsets, which can then be merged to increase the effective depth of field. More projects! This was a quickie weekend boondoggle, except for waiting for the joystick board to arrive. Well worth the effort to add an improved tool to the lab.